At least once a month, usually in the midst of a not so great work day, I get the overwhelming urge to feel sorry for myself that I’m not in Paris. Eating ham and cheese baguettes. Wearing a scarf. Sipping wine in a properly manicured garden. Generally absorbing Frenchness. This past weekend, I tried to use that specific self pity for a good cause: a tart. I decided to get some inspiration for my tart quest by spending the better part of an evening reading Thomas Keller’s Bouchon Bakery cookbook with the intensity of a tween reading Twilight. If you have never thumbed through one of his books, please do yourself a favor and do it. Even if you just go to Barnes and Noble and skim it quickly, pretending like you intend to purchase. He has such a gift for making OCD-ish technical skill look effortless in photographs and in his food. I was so amped that I felt like I could just buy the nice butter from Whole Foods and whip up a batch of almond croissants right in my very home (something I know I must attempt someday, but for now, a tart must do). He shares excellent advice that is just as applicable to home cooks as it is to the professionals in his kitchen: make working clean your philosophy, practice making the same recipe over and over to “become attuned to the nuances of the way the ingredients behave,” and you CAN make Nutter Butters into a sophisticated treat. Maybe the last one isn’t as universally valued, but still excellent advice. My younger sister made this blackberry tart recipe for our family a year ago and it’s been one of my favorites ever since. I chose to use a different tart dough method, which came from a French cooking instructor and turned out to be a far more elegant preparation. The recipe tells you to combine heated butter with flour for a hot, pliable mixture. This is a departure from a traditional tart recipe that asks you to work bits of cold butter into flour, chill the dough and then roll it out into a tart mold. However, the result was the same flaky crust you expect from the chilled version, but in less time and with much less flour on the counter. I’ve doubled the recipe in the instructions below because the original recipe didn’t fill out the 9-inch tart pan completely. The buttery crust, tangy filling and fresh berries make this dessert well balanced and surprisingly light. Now, I would love to say that I just happened to be strolling the farmers market in Santa Monica on Saturday, and I just stumbled upon the most ripe, photo-ready blackberries. But, in the spirit of being honest, I have to say I got them at Trader Joe’s and I had no guilt about it once I tasted the finished product. If the lack of farmers market berries is what would hold you back from making this, just give it a try. The tart also doubles as a decadent weekend breakfast with morning with coffee. Here’s to Paris! 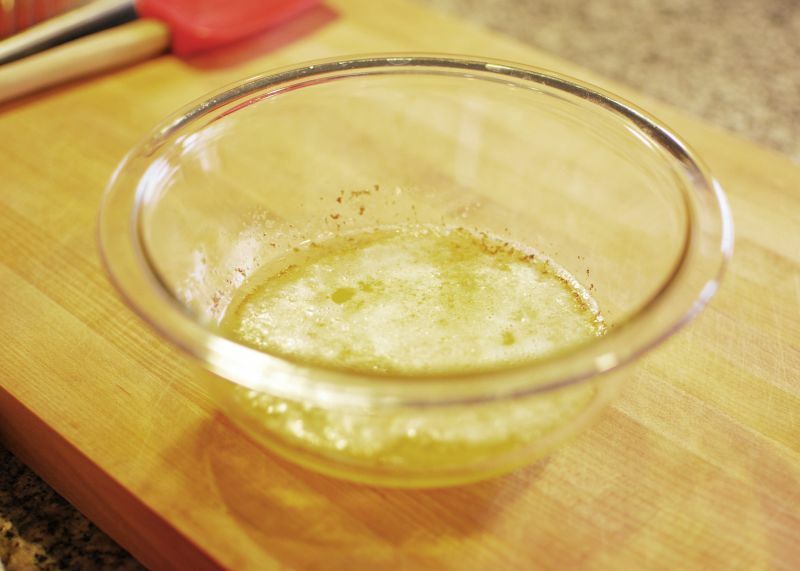 Combine butter, oil, water, sugar and salt in a ovenproof bowl, such as a Pyrex. Heat the mixture in the oven for about 15 minutes, until the butter begins to bubble and turn brown. Carefully remove the bowl from the oven (it will be very hot) and quickly stir in the flour until it becomes a ball of dough that pulls away from the sides of the bowl. Transfer dough to a 9-inch tart pan. When the dough is cool enough to handle, press it into the shell and up the sides of the pan to create a crust. Use a fork to pierce the bottom of the tart dough. 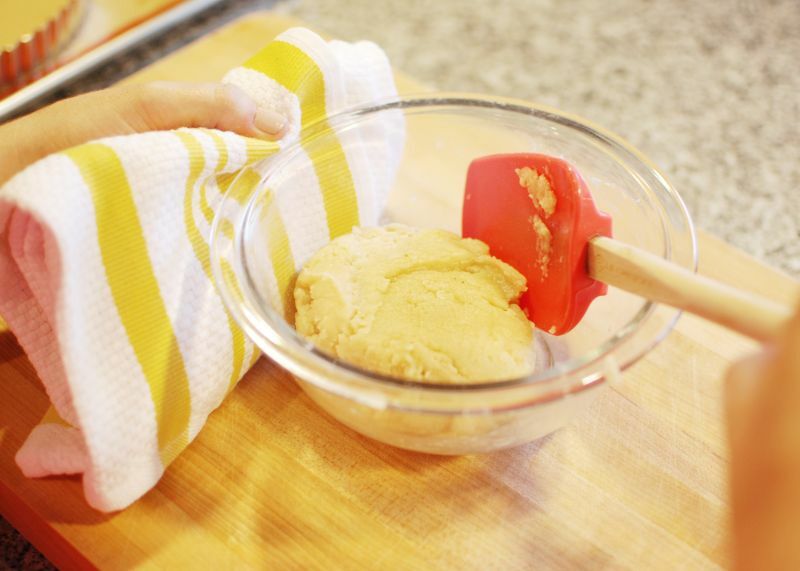 There may be holes in the crust after baking, so reserve a small piece of dough to fill in any cracks. 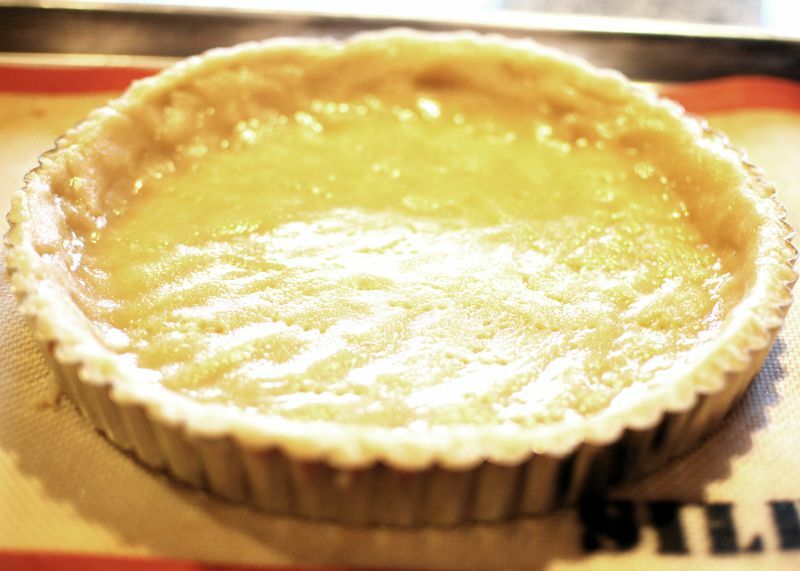 Bake the tart crust for 15-20 minutes until it’s golden brown. Transfer to a wire rack and let cool completely. Meanwhile, combine the mascarpone, sour cream, honey, vanilla extract and nutmeg in the bowl of a stand mixer fitted with a whisk attachment. Beat until smooth. Spread the filling evenly in the cooled tart shell. Top with berries in a circular pattern. Chill for about an hour before serving. 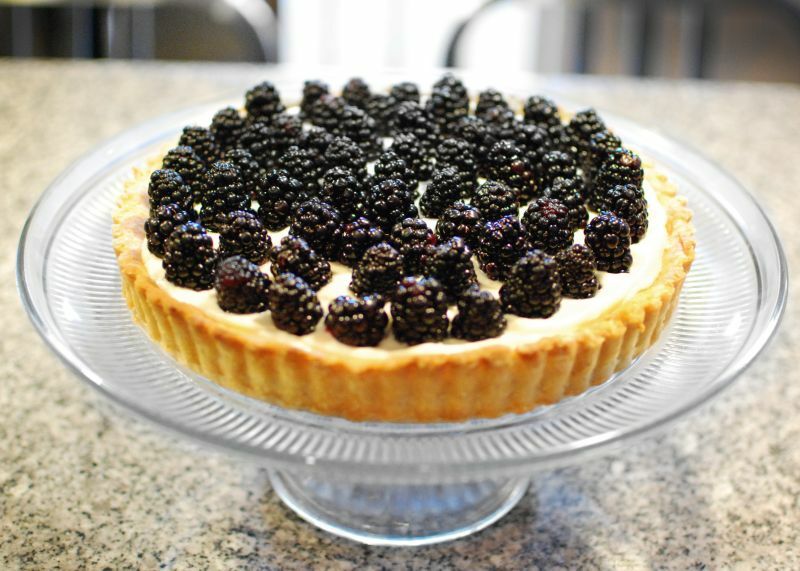 This entry was posted in Dessert and tagged blackberry, dessert, tart, Thomas Keller on May 22, 2013 by Claire Webb.